We are also working on support for auto-downloading games (on demand) directly to FS-UAE Launcher – where possible. The reason for these changes is that while the primary function of oagd.net was to serve as an online configuration database for FS-UAE Launcher (and other clients), the scope of the project grows, as we now also try to host game ourselves where possible – or link to legal download pages. People may now start to browse oagd.net without necessarily wanting to edit the online database. Just did a quick photoshop mock up to give you some ideas about reshuffling the UI. It’s by no means a final idea, just something for though. I was thinking also that maybe you could have each page have a colour theme based on the game cover. I know iTunes does this automatically (http://tinypic.com/r/aafw2w/5), but we could maybe have an option to edit the colours for each game? Back ground gradient colours, and main text and title test colours? Thanks for the mockup 🙂 I’m not sold on all the changes, but there are indeed some good ideas there. I especially like the new tab placement and think I might adopt that :D. Extra graphics for rating, and flags for languages are also planned! I’ve created a simple example for what I mean. On the screenshot you see the game “Yo! Joe” (my favorite btw 🙂 ). The title bar, FAQ/Contrib. area, screenshot area and synopsis/disclaimer area have 25% transparency. The game entry area have 50% transparency. I don’t know, as this could be separated. The backdrop is a screenshot of the game. Maybe one could use the lightest or the darkest contributed screenshot. 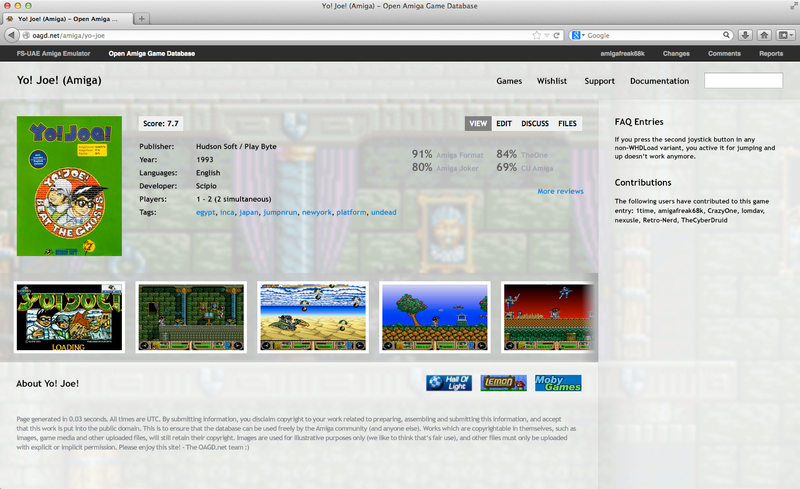 This screenshot could be scaled to fit the game page in height and width but keep aspect ratio. The screenshot must be centered to look good. Also the screenshot have a color overlay of white with 50% transparency. As filter I have blurred this screenshot. Maybe it would be useful for this reasons to create a “cover wall” or in this case “screenshot wall”, with dimmed, scaled and (maybe) blurred screenshots of the game. Well, it’s not easy to say what looks good or not until someone takes a screenshot of an oagd.net games page and, and manipulates in backdrops (or similar) so there is an actual example to look at! What about a dimmed (25/50/75% transparency or so) fan art picture as backdrop of the frontpage of a game? – The pages are flexible and uses the available width, this makes it somewhat more difficult to do a backdrop which looks good in all cases. – Depending on the background, this may cause text to be more difficult to read, and with flexible pages, it isn’t easy to design the backdrop *around* page content. – Having a large number of backdrops designed for a specific page layout could very much “lock” that layout – it may not then be possible to make layout improvements without breaking the existing backdrops?